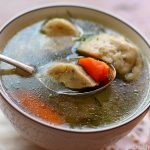 Full of veggies, tender chicken and melt away matzo balls this Jewish Chicken Soup is the Real Jewish Penicillin, perfect for sniffles and heartbreaks. Wash out your chicken and place it in the stockpot and cover it completely with COLD water. And let it simmer. You are going to notice the scum start to come up. It's really just coagulated blood. I let it simmer away for about 25 more minutes. In the meantime, prep your gorgeous carrots. I like to get the ones with the greenery still attached to them. It somehow makes everything seem better in life. Same with your parsley root. What's that? You never used a parsley root? Well it's magnificent! It is sweet and gloriously parsley like! Plus you get to use the actual leaves attached to the parsley root as...PARSLEY! Brilliant huh? Don't forget to clean two onions as well! And then I use an unorthodox approach. I dump the broth out into a large colander so that we can start fresh with a new broth. This is how Asian broths are so nice and clear. Make sure to rinse the chicken and the pot of all the scum. And now we place all the veggies, parsley, dill, chicken, salt and pepper into the pot. Cover it again with cold water and let it simmer on medium-low for about 2 hours. In the meantime let's make our matzoballs. Combine all the ingredients for your matzoballs in a large bowl. I like to add dill to mine to increase the flavor and the color. Mix it all up with a spoon until it's nice smooth. Place this mixture into the fridge for 20 minutes. And get a pot of water with salt on the stove. Bring up to boil. I like to use a little ice cream scooper to scoop them into my hand and then roll the balls out. Then place them on a plate. Now for me, the secret to fluffy matzoballs also has a lot to do with how long you cook them. If you want a dense and heavy matzoball, cook it for 25 minutes. If you are going for airy and light floaters, you are going to want to boil them for 35-40 minutes. Drop them into the simmering pot of water carefully, one by one. Turn it down to a simmer. Cover it. And let them cook for 35-40 minutes. Once they are finished, you can serve them immediately with the soup or you can cool them completely then place them in another container in the refrigerator. Now back to our chicken soup. Taste it. Make sure it's as sweet as you want it and add salt if needed. There we go...golden. Beautiful and delicious. If you want to skim the fat off some, the easiest way is to place it in the fridge and let the fat solidify over night. Then you can go ahead and just remove the fat solids. I like to leave the fat in.